Whether it’s moving valuable items like pianos or works of art or it’s a matter of packing fragile china and silverware, we fully understand just how many things can possibly fall or break during a move. Following our discussion of creating a dish box to transport your dishes and other breakable kitchen goods, we next take a look at that most breakable of glassware packing tasks: packing wine and wine glasses. Whether you’re transporting some serious vintage bottles or simply aren’t interested in buying a whole new wine glass set or replacing the one you received from your wedding, here’s what you need to know when packing wine and wine glasses. One thing to consider, in particular, is whether you want your bottles packed vertically or horizontally. Packing horizontally is arguably a better fit for packing wine as opposed to for packing wine glasses as less pressure is applied on glasses when placed vertically, but that can be minimized by heavy padding. We feel strongly about utilizing cell boxes as they are designed with the most protection in mind. And if you are unable to find any that are right for you, it’s simple to fashion your own by using folded paper plates to create the barrier. The horizontal method is often seen when shipping older vintage bottles of wine across long distances, like from France to Chicago. As we discussed in our previous piece on packing plates and silverware, it may be tempting to use newspaper for any and all types of padding needs but let’s not forget how your fingers look after a few minutes of reading the Tribune. Right? Right. While glass might not have the oily surface that will attract as much ink, it can still easily be spread across their exterior. Instead, use clean, white tissue paper to achieve the gentle touch your glasses need. One sheet of tissue can protect against a number of different possible scratches obtained from the box moving around while in the moving truck. One last piece of advice from the pros: if you decide bubble wrap is something you want to use as well to protect your wine glasses when packing, place the tissue paper down first and then wrap the glass or wine bottle with the bubble wrap on top of the tissue paper. 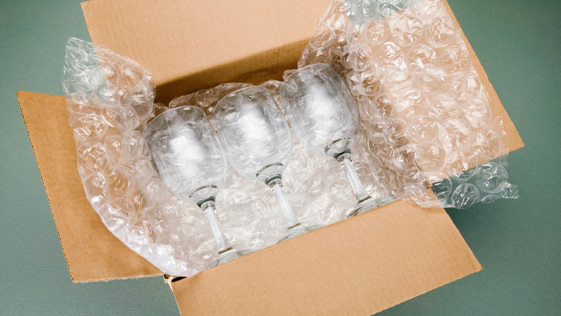 Otherwise, a suction force is formed between the bubble wrap and wine glasses meaning broken stems and more. OK, this last tip is mainly for those winos out there who have an impressive collection that are worth at least the price of a small home. As you likely know if you’ve taken the time and care to curate your own wine collection, you need additional research on each year and bottle to learn about any particularities, like packing them upside down or at a different angle. And be sure to label the box with these instructions so that you don’t forget any specific needs and communicate those verbally as well to any of the best Chicago movers you’ve hired.